Remove head and de-vein the shrimps while keeping the shells on. Mix corn flour and red pepper flakes in a small bowl. Toss with shrimp evenly and set aside. Using a mortar and pestle, pound the garlic into bits. Alternatively, you could chop them with a knife. In a large skillet or pan, add in butter and olive oil. Turn on heat to medium. Once the butter is almost melted, add in garlic and cook over low medium heat until golden and crispy but not burnt. Remove and set aside. Turn up heat to high and add in shrimps. Cook for 30 seconds before adding in white wine. 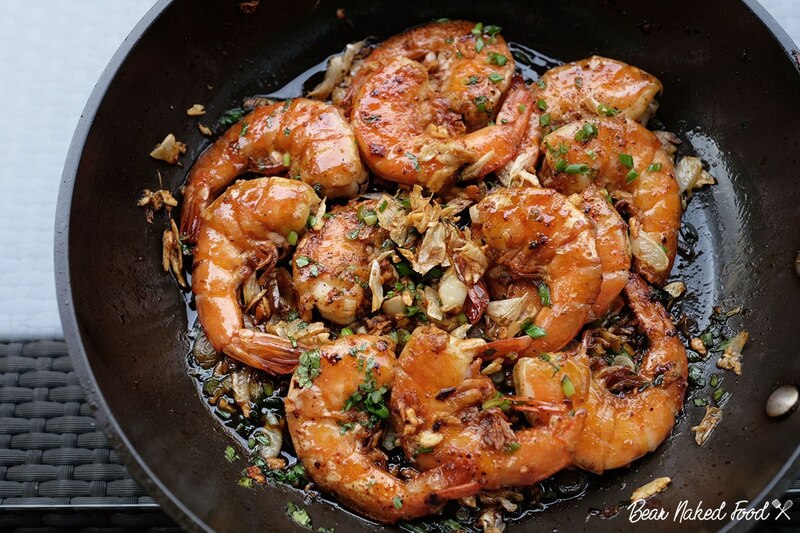 When the shrimps start to turn pink, add in sauce and mix evenly. Cook for another minute and add in fried garlic and black pepper. Toss well and turn off heat. Squeeze lemon juice and sprinkle the chopped green onion and coriander.